Following the attack on a German tourist by a Beach Road motorcycle taxi rider a meeting was arranged Sunday at Alcazar. It was designed to issue a strong message - but several top figures were absent. Some 50 representatives of the "win" riders were present to hear lectures from the Department of Land Transport, Bang Lamung authority and the military. They were told that despite reorganization, training and appeals for cooperation the motorcycle taxi drivers in Pattaya were still misbehaving. Pattaya is an important tourist destination and the "win" simply must do better said the DLT's Nopparat Sarachainakorn. The message was clear: Be good to tourists and locals and do your job properly. And stress was made on no more extortionate fares - no more taking advantage of anybody. Pattayapal.com mentioned the importance of the image of Pattaya in their headline. Last week a rider was caught on film kicking German tourist Andreas Bauer in the face as he attempted to wheel his rented bike away from a traffic stop. 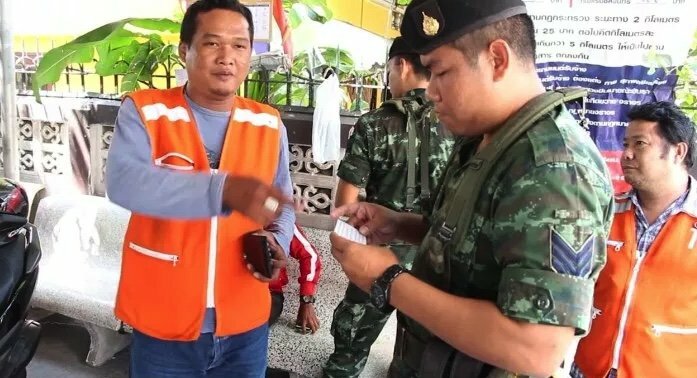 His action looks like it has prompted quite a strong reaction from the authorities to clear up the bike taxis though Thaivisa notes that several more senior figures in Pattaya - and the police themselves - were notable by their absence from the meeting on Sunday. a meeting was arranged Sunday at Alcazar. Lots of boys in brown there. There are three ways to address problems such as this one: education, education and education. My wife started giving computer education to primary 4 and 5 kids at the local school; in a class of ten, three can neither read nor right. No hopers like these will end up motorbike taxis in Pattaya, where they'll use their position of strength vis-a-vis the naive tourists to extort them while greatly enjoying doing it. .…………...and with a vacant smile, they all said...…..YES! Pattaya is an important tourist destination and the "win" simply must do better said the DLT's Nopparat Sarachainakorn﻿. So, people that visit, lives and use this services in Khon Kaen, Udon Thani, Ubon and all other cities in Thailand are not at all important. I guess they must enforce the rules everywhere. But we can forget it´s Thailand. It will always be at the discretion of the one you meet. The army spokseman was heard saying...Now listen here you orrible lot no more extortion of tourists, thats our job, got it, ok carry on. The message might have been clear enough, but it is the understanding of said message and the likelihood of it being taken on board by the moto taxis, or should I say unlikelihood, that matters. Things like this have been happening for ages, so hoping that a message will stop further incidents, is to my mind, pretty optimistic. Throwing offenders in jail for a year or two might be a stronger message that gets a reaction. The article did not say all that was told to the motorcycle taxis by the authorities regarding the tourists. They also said no more extortion money unless we people get 50% of it. Carry on boys and if you don't have a license, it's ok, just no face kicking! Whole motosai taxi system is corrupted, starting from how u get licence and that orange jacket. Thats a nice business there. Yeah, they did But I think the main issue and they needed to re-programmed was to be told by the Authorities that they would be expecting a cut of50% given to them instead of the normal 35%of the extortion money they receive from tourists. Otherwise, it would become difficult for them to operate.